The glory days of our local baseball team seems eons ago, but with April, hope springs eternal with a new Major League Baseball season upon us. Perhaps this is the year our boys will carry the day right into October? One can only hope, and graze your way around the Safe as you do so. Seattle’s game food culture is a unique signature of the city, and has been for years. Tailgating at Seahawk games is an art form, and often a competition that aligns with the game on the field (Anyone remember the Seahawks game day Philly Steak versus Smoked Salmon throw down?) Husky games bring their own flair as folks tailgate on their boats, one of the coolest and most unique sights in college sports. The baseball stadium, in many people’s minds, tops it all, and for many reasons. First off, Safeco Field is one of the few venues in MLB where you can bring in outside food. Vendors line up along the access to the stadium and you can bring in your own peanuts and cracker jacks for a fraction of the inside prices. I have actually seen folks carry in pizzas! Secondly, if you decide to partake in the grub inside the Safe, you can actually walk around the stadium completely, grazing your way from snack to snack without missing a pitch. Choices range from the traditional hot dogs and beer to Dungeness crab sandwiches, Garden burgers and Ichi-rolls (Safeco Field’s take on a spicy tuna roll). New to the Safe’s offerings for 2012, local Celebrity Chef Ethan Stowell has brought his A game to new concession offerings including grass-fed BBQ brisket and pulled pork sandwiches, an updated "anti-fast-food" burger, and an Oyster Po’ Boy. All of this sounds yummy, and since I have eaten most of these, I can attest to the fact that pretty much everything tastes great as well. However, if you are eating at the ballpark, Safeco’s signature “eat” is not a hot dog, or cracker jacks, but rather Garlic Fries. 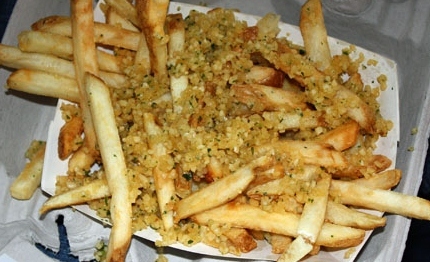 Take what seems to be a normal order of fries, add about a pound of garlic and a dusting of parsley. They are more than the words on the page, so delish they are habit forming and for many non-baseball fans the only reason to go to the ballpark. So popular, the air in the Safe is infused with the scent of garlic. Combine that with the spectacular city skyline beyond the stands, the sun setting over Elliott Bay and it is a not-to-be-forgotten eating AND ballpark experience. We are an “Rated Excellent” Property on Flipkey! Are you Rock n Rolling?